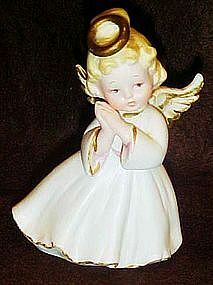 Adorable Lefton angel made of bisque porcelain. GOld accent trim on wings and halo. Has red foil Lefton sticker and the number 1420 on the bottom. She measures 4 1/4" tall and is in perfect condition with no chips or damages.